Alabama's 7th congressional district is a United States congressional district in Alabama that elects a representative to the United States House of Representatives. The district encompasses Choctaw, Dallas, Greene, Hale, Lowndes, Marengo, Pickens, Perry, Sumter and Wilcox counties, and portions of Clarke, Jefferson, Montgomery and Tuscaloosa counties. The district encompasses portions of the Birmingham, Montgomery and Tuscaloosa/Northport urban areas. The largest city entirely within the district is Selma. 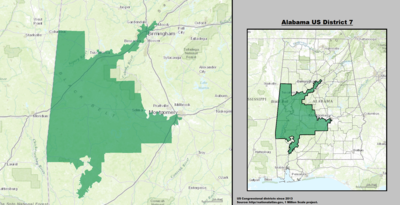 Alabama's 7th congressional district - since January 3, 2013. The district has been majority nonwhite, with a majority of African-American residents, since the redistricting following the 1990 census. It is represented by Democrat Terri Sewell, who succeeded Artur Davis in 2010. Alabama's 7th Congressional District was first defined in 1843; it has continued since then with the exception of the years 1867–1873 during the Reconstruction era. The geographic area represented by this district has changed over time, depending upon the number of U.S. Representatives apportioned to Alabama. Around the turn of the 20th century, the district included the city of Gadsden. Over time, the district was redefined to include the area around Tuscaloosa. The last two representatives for the district before its reconfiguration as a majority-minority area were Richard Shelby (now Alabama's senior senator) and Claude Harris, both Tuscaloosa residents. The shape of the current district was largely established in 1992, when it was reconstituted as a majority-minority district under provisions of the Voting Rights Act of 1965, as amended in 1982 to encourage greater representation for minorities in Congress. Half of the western Alabama portion of the district was moved to the 4th district, and a large portion of Tuscaloosa County was moved into the 6th district, which had primarily been based around Birmingham. To counter the loss in population and to create the majority minority, many counties from the Black Belt region, a rural expanse in Alabama with a high proportion of African-American residents descended from workers on cotton plantations, were added to the district, as was an arm extending from Tuscaloosa roughly along the Interstate 20/59 corridor into Jefferson County to take in most of the black precincts of Birmingham. Most of Birmingham's white residents remained in the 6th District. The three representatives elected from the district following reconfiguration—Earl F. Hilliard, Artur Davis and Terri Sewell—have all been residents of Birmingham. Mostly minor changes in the following two redistrictings have not substantially changed the shape of the district. But, western portions of Montgomery County have been restored to this district, including large swaths of inner-city Montgomery in the redistricting following the 2010 census. This area had earlier been removed after the 2000 census. The district contains urbanized areas of Birmingham, Montgomery and Tuscaloosa, and ten of the fourteen rural counties in the Black Belt. Three of the state's largest colleges are located in the district: Alabama State University in Montgomery, the University of Alabama in Tuscaloosa, and the University of Alabama at Birmingham. Democrats have represented the 7th district in all but 6 years since 1843. A majority of voters in the district are African Americans who support the Democratic Party and its candidates. District created March 4, 1843. September 10, 1846 First elected in 1842. March 3, 1851 Elected to finish McConnell's term. March 3, 1857 Redistricted from the 3rd congressional district. January 21, 1861 First elected in 1856. March 4, 1863 Members withdrew during the American Civil War. March 4, 1893 Redistricted from the At-large district. May 13, 1919 First elected in 1898. March 3, 1923 Elected to finish Burnett's term. March 3, 1933 First elected in 1922. September 15, 1940 Redistricted from the 10th congressional district. January 3, 1941 Elected to finish William Bankhead's term. February 1, 1941 Elected in 1940. January 3, 1949 Elected to finish Walter Bankhead's term. January 3, 1963 First elected in 1948. January 3, 1973 First elected in 1966. January 3, 1979 Redistricted from the 5th congressional district. January 3, 1987 First elected in 1978. January 3, 1993 First elected in 1986. January 3, 2003 First elected in 1992. January 3, 2011 First elected in 2002. Present First elected in 2010. As of October 2017[update], there are three former members of the U.S. House of Representatives from this district who are living. ^ Pear, Robert (August 3, 1992). "THE 1992 CAMPAIGN: Congressional Districts; Redistricting Expected to Bring Surge in Minority Lawmakers". The New York Times. Retrieved April 23, 2010.